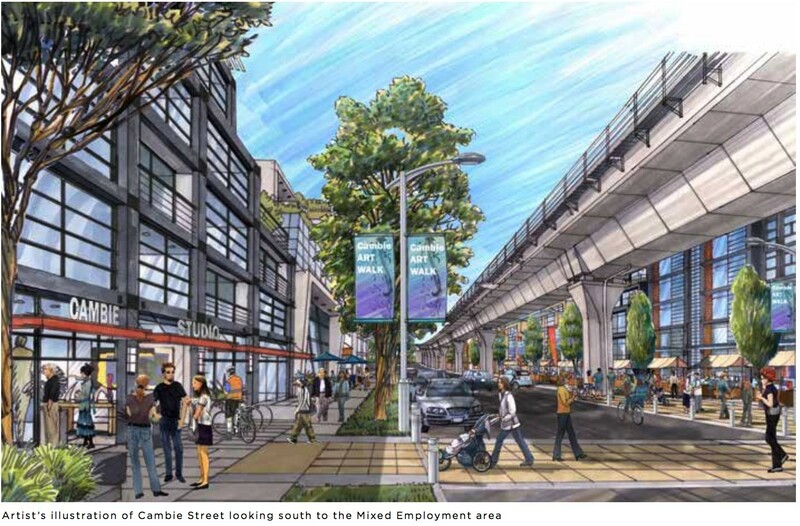 The City of Vancouver has outlined a comprehensive strategy to densify the Cambie Street Corridor as part of its wider plan to address the region’s housing crisis and optimize the investment made on the Canada Line. 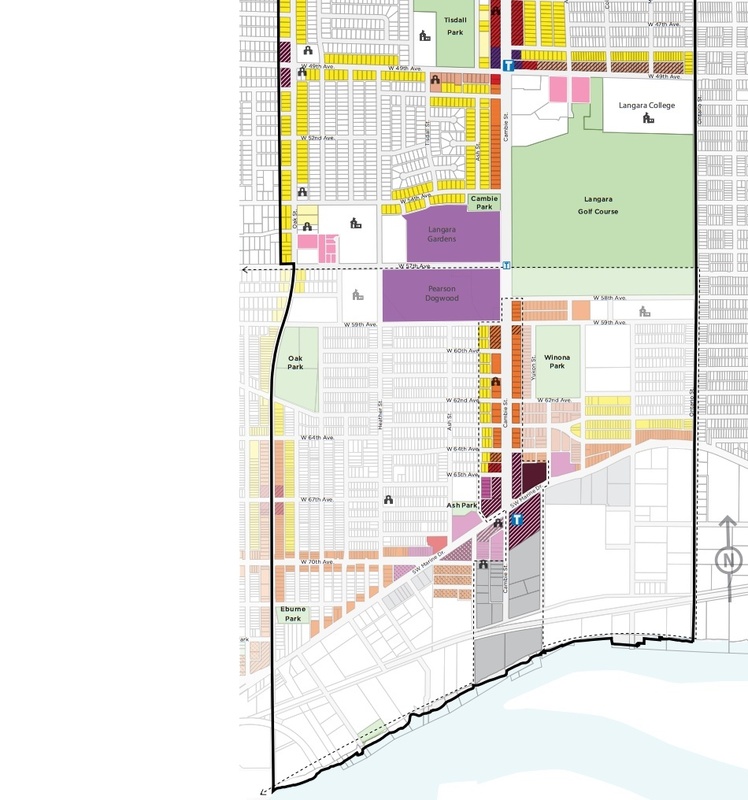 A full draft of the municipal government’s Cambie Corridor Plan (CCP), released this week, calls for additional housing to boost the corridor’s population by more than 50,000 people – from 34,700 people today to up to 85,000 people by 2041. Nearly 20,000 of these residents will live in new purpose-built redevelopments at the old RCMP headquarters on the Heather Lands, Oakridge Transit Centre, Oakridge Centre shopping mall, Langara Gardens, and Pearson Dogwood, and another 7,000 people will live within parts of the Corridor that fall within the Marpole Community Plan area. About 9,200 additional jobs will also be created, an increase from the 23,500 jobs found in the area in 2011. The Cambie Corridor, which is of course centred around Cambie Street, is identified as the area framed by West 16th Avenue to the north, Ontario Street to the east, Oak Street to the west, and the Fraser River to the south. The densities will be greatest along arterial roads, with adjacent blocks generally receiving less density to allow for a transition to low-rise buildings, townhouses, and single-family home areas. Affordable and social housing levels are also established by the CPP for certain sites, with some developments required to set aside at least 20% of the net residential floor area for secured rental housing, social housing, or below-market/secured rental housing. 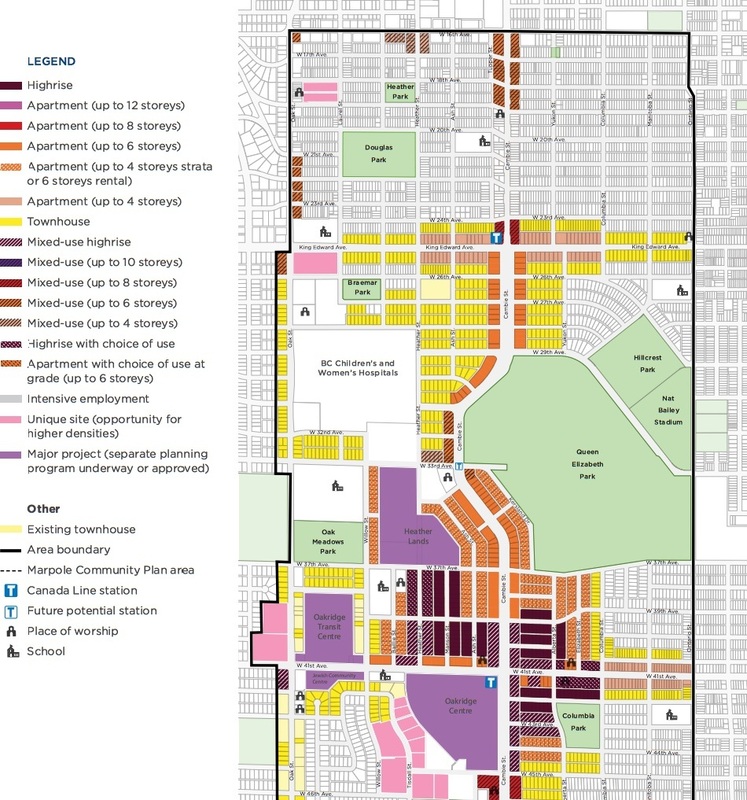 For instance, a target of 2,250 social housing units and 5,000 market rental housing units for the corridor north of 57th Avenue is planned by 2041, and additional social housing is possible for the area south of 57th Avenue in Marpole. Fairly modest densities are envisioned around the Cambie Village area – even the immediate area around King Edward Station. 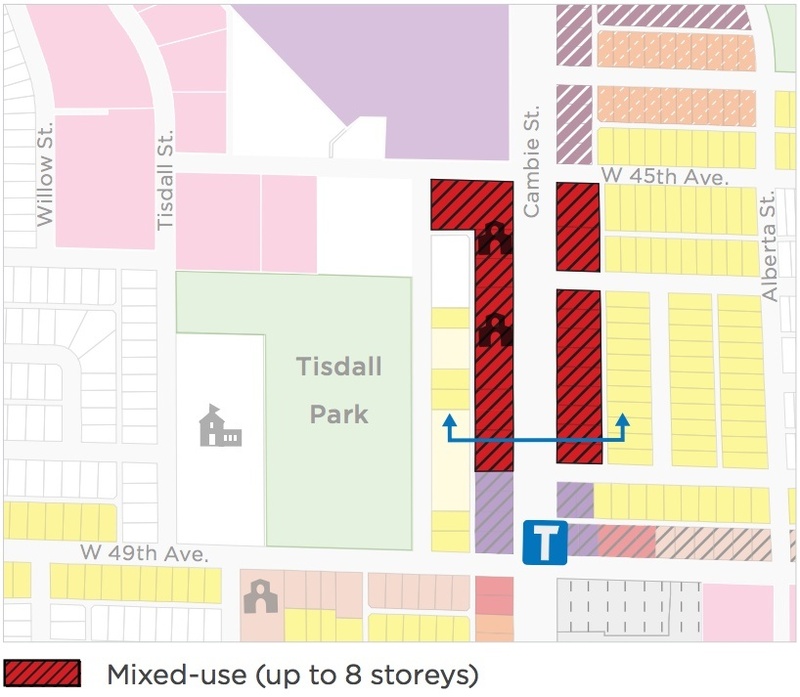 Residential buildings up to six storeys, with ground-floor retail, will be permitted on Cambie Street between West 16th Avenue and West 19th Avenue as well as select areas on the corridor’s periphery on Oak Street between West 21st Avenue and West 24th Avenue. Some nearby patches will see only structures no higher than four storeys. The tallest buildings, up to eight storeys, will be located on two blocks immediately adjacent to King Edward Station, which is largely surrounded by townhouses up to three storeys and apartment buildings up to four storeys. The unambitious heights are partially due to the limitations posed by the view cones from Queen Elizabeth Park. 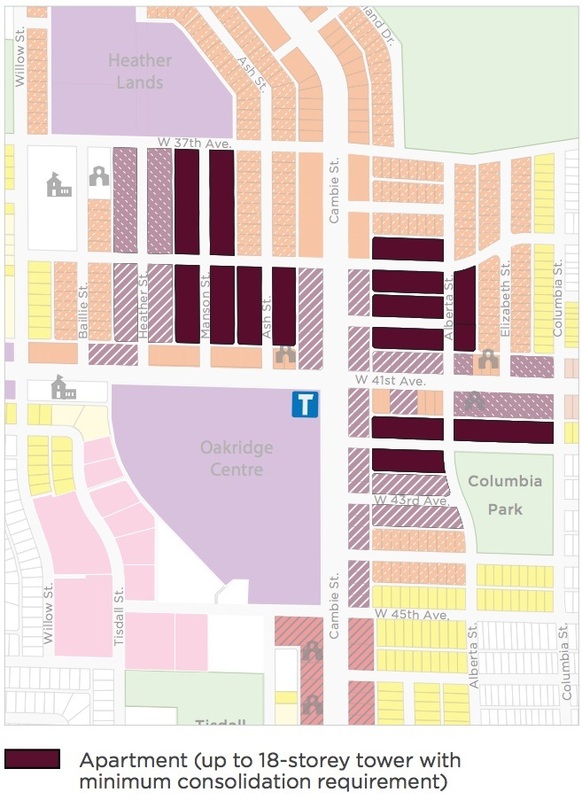 Most of the area defined as the Cambie Village will remain as single-family housing. 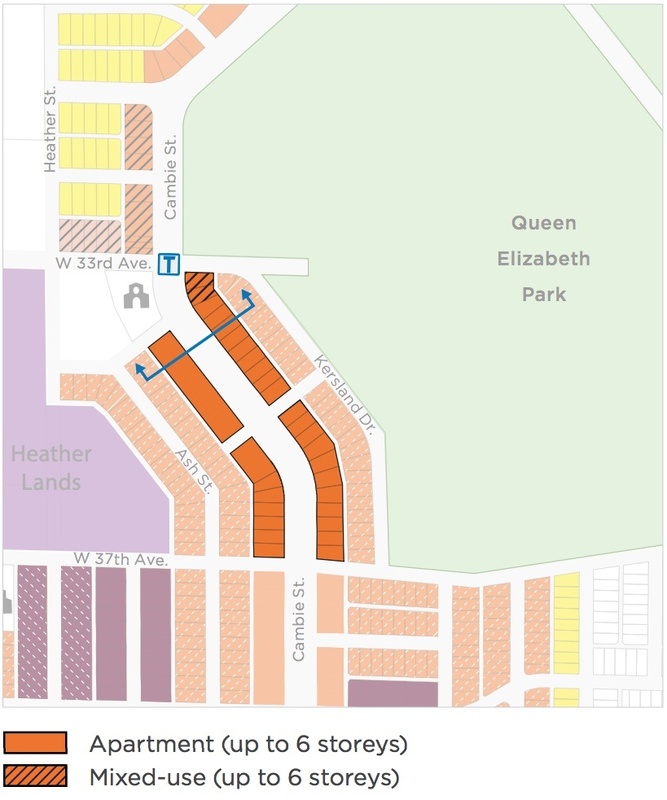 Densities within the Queen Elizabeth Park area, between King Edward Avenue and 37th Avenue, are generally a notch higher than Cambie Village, and it will result in the redevelopment of most of the single-family housing found in the neighbourhood. The stretch of Cambie Street from King Edward Avenue to 57th Avenue will see apartments up to six storeys tall. 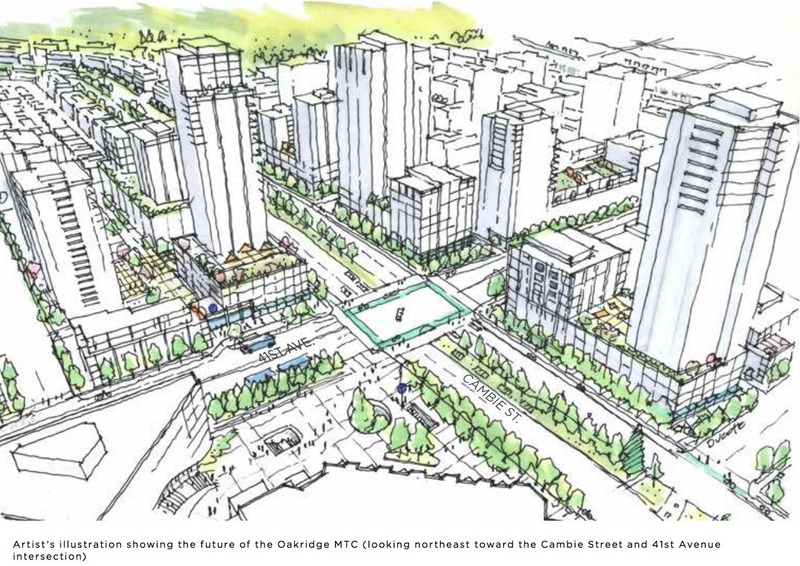 Low-rise buildings up to six storeys are planned beyond both sides of Cambie Street, outside of the arterial, around the intersection of West 33rd Avenue, where a future Canada Line station could be built. This cluster of density is also immediately adjacent to the old RCMP headquarters redevelopment on the Heather Lands. 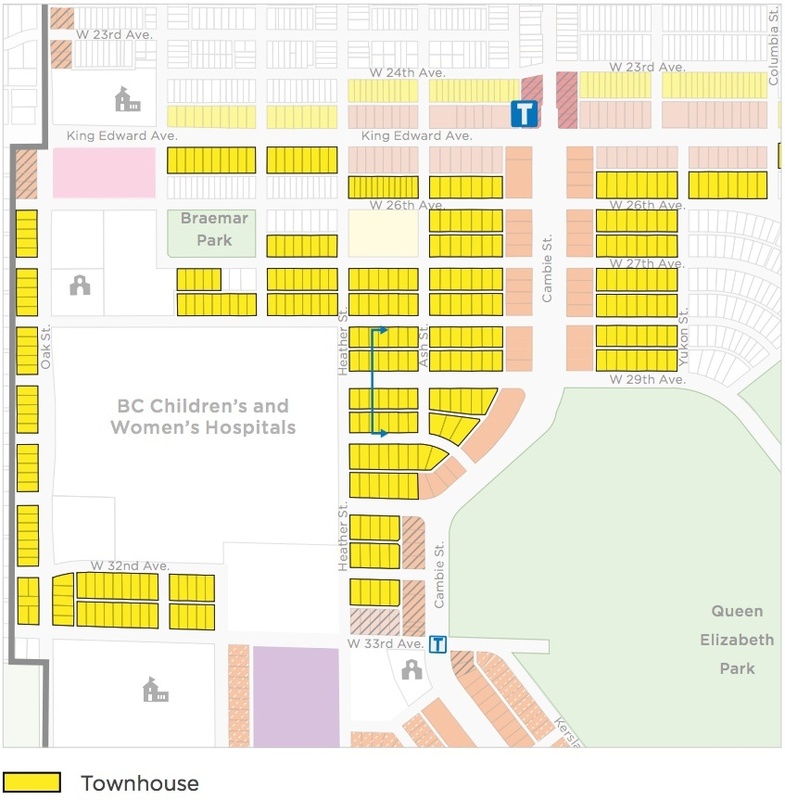 Additionally, most of the remaining single-family residential neighbourhood west of Cambie Street to Oak Street will be designated as sites for townhouse redevelopment. A secondary cluster of townhouses is also located in the general area southeast of King Edward Station. King Edward Mall, the four-acre strip mall – anchored by Safeway – located on the southeast corner of the intersection of King Edward Avenue and Oak Street, is envisioned for a redevelopment with up to 14 storeys. 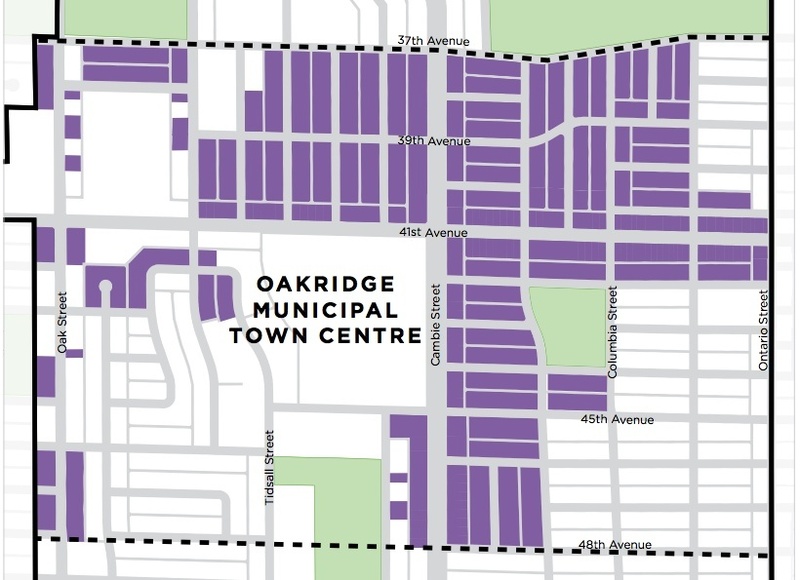 The largest new densities along the Cambie Corridor will be in the area identified as the Oakridge Municipal Town Centre, which stretches far beyond the property of Oakridge Centre shopping mall and Oakridge-41st Avenue Station. This area of great significance – Vancouver’s only town centre outside of the downtown peninsula and Central Broadway Corridor – is framed by West 37th Avenue to the north and West 48th Avenue to the south and Oak Street to the west and Ontario Street to the east. 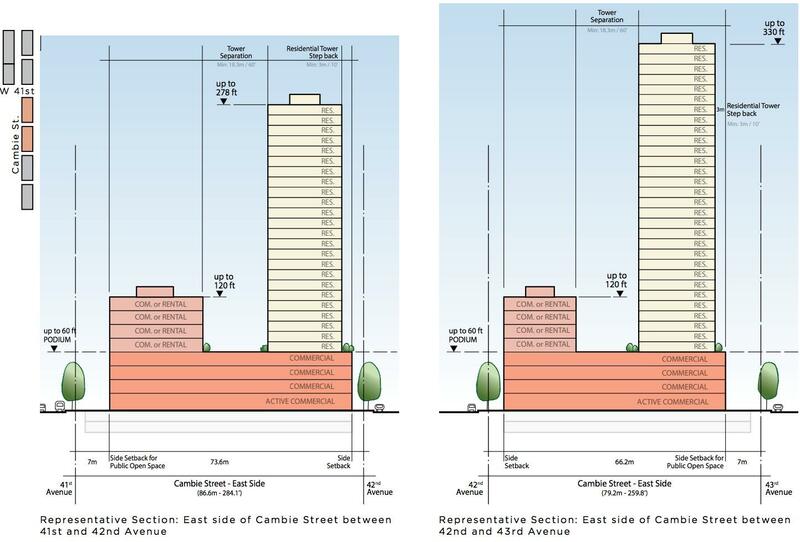 Along Cambie Street between West 39th Avenue and West 45th Avenue, the CPP will allow towers varying from 160 ft to 330 ft in height, with the tallest heights located immediately around where the street intersects with West 41st Avenue and West 43rd Avenue. These towers will also be perched on top of 60 ft podiums with retail on the ground level and offices on the upper levels. “The area provides ample opportunities for the creation of high-quality, engaging architectural forms signifying this ‘High Street’ commercial core with accompanying public plazas, active streets, and at-grade shops and services,” reads the plan. 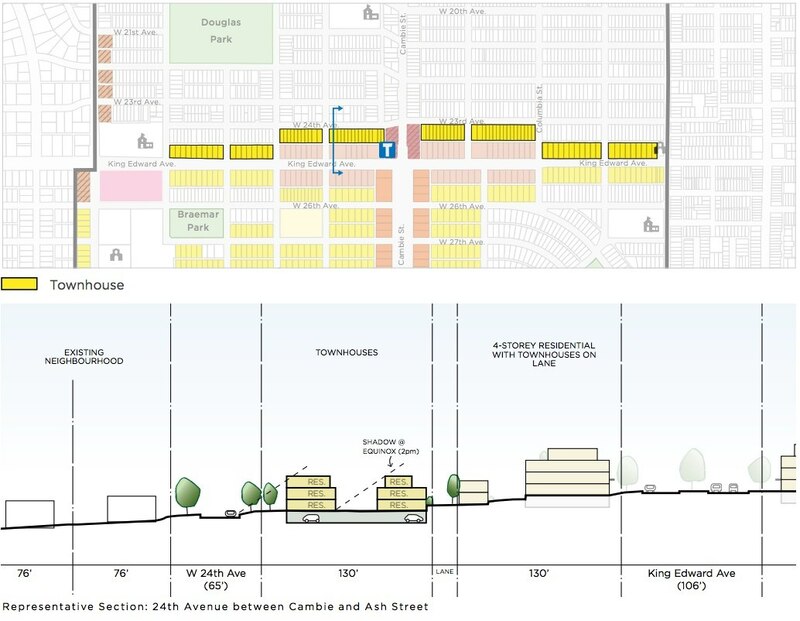 Adjacent city blocks within an approximately two block radius beyond the intersection of West 41st Avenue and Cambie Street will see towers up to 18 and 20 storeys, depending on the site. Further out into the existing single-family neighbourhood from the intersection, the area is restricted to up to four, six, or eight storeys, depending on the site. 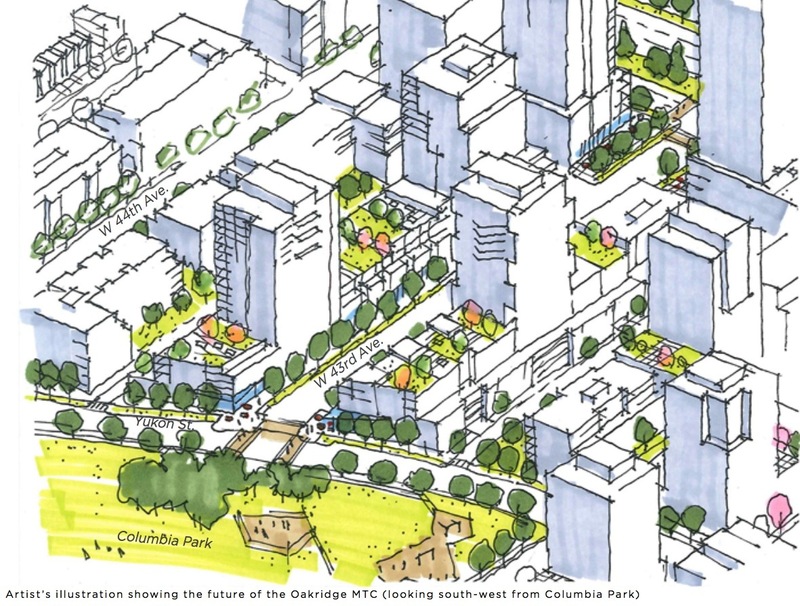 Of special mention, two blocks of Heather Street, an existing neighbourhood street, between West 37th Avenue and West 41st Avenue will be transformed into a pedestrian-oriented, local shopping street to provide a connection between the old RCMP redevelopment at the Heather Lands and the Oakridge Centre redevelopment. Another local shopping street is planned for the one-block stretch of West 43rd Avenue from the lane east of Cambie Street to Alberta Street. Both of these new local shopping streets are lined with 18-storey buildings with a four storey podium that contains ground-level retail and restaurant space. Three-storey townhouses will provide a transition from the areas of towers and low-rise buildings to the single-family homes and line Oak Street. 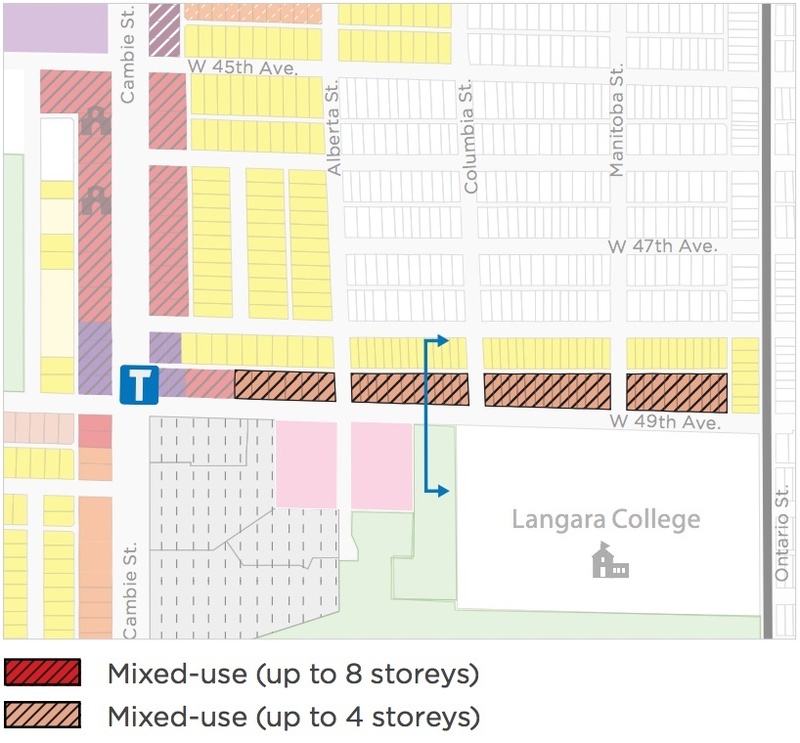 The planned densities within the Langara neighbourhood, specifically the area around Langara-49th Avenue Station, are a notch higher than the Queen Elizabeth densities. 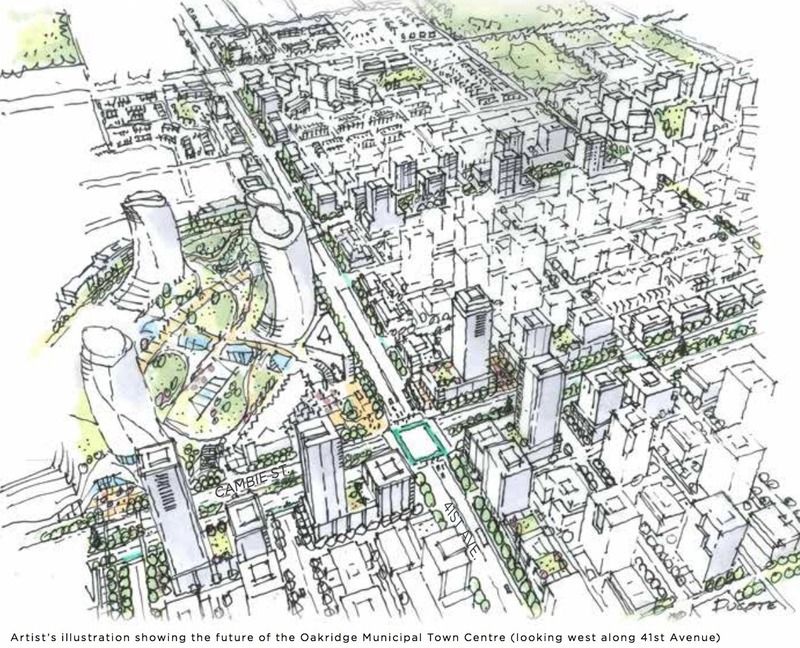 Buildings up to 10 storeys, with commercial uses on the ground level and residential above, are envisioned for the area around the station. Mixed-use buildings up to eight or 10 storeys continue north along Cambie Street from West 49th Avenue to West 45th Avenue. 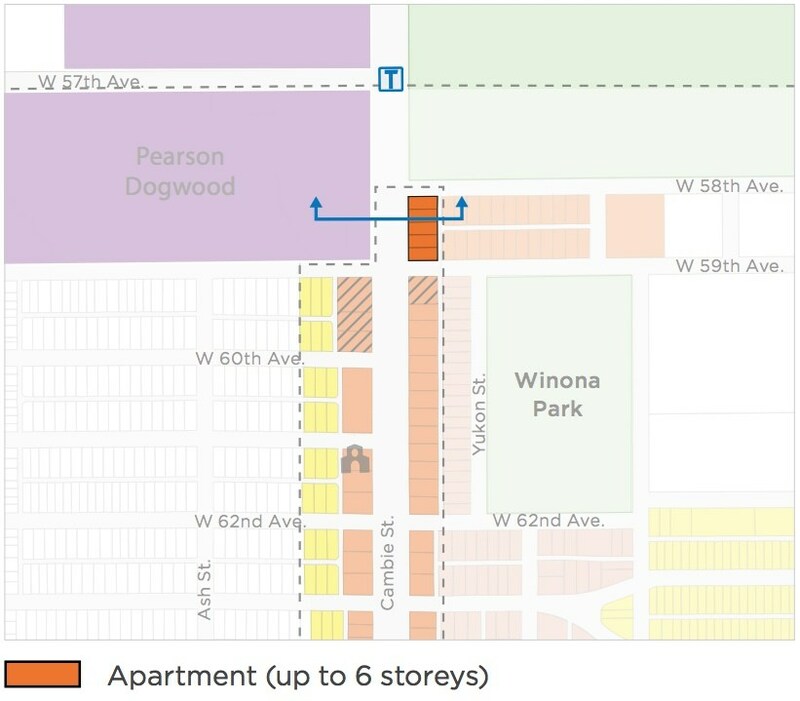 On the north side of West 49th Avenue between Alberta Street and the lane west of Ontario Street, the CPP calls for continued mixed-use buildings up to eight storeys. 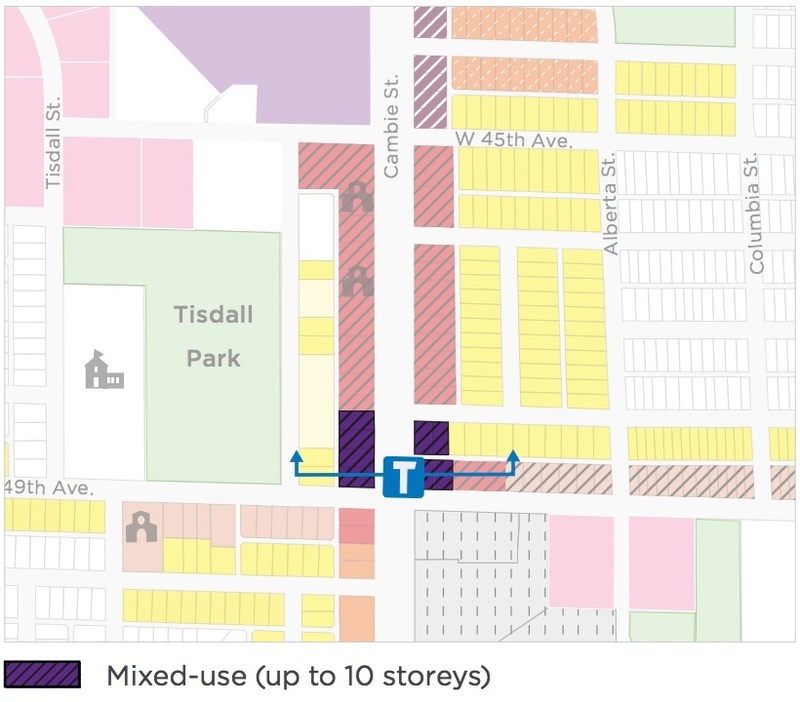 However, the densities are much more gentle along West 49th Avenue west of Cambie Street, as the CPP envisions four-storey apartments and three-storey townhouses all the way to Oak Street. 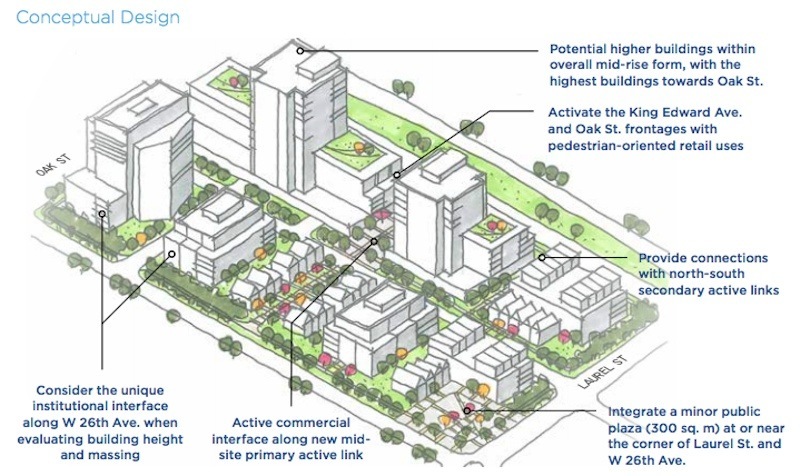 Apart from the 12-storey mixed-use buildings, with commercial on the ground level and rental housing in the levels above, at the intersection of Oak Street and West 49th Avenue, lighter densities calling for townhouses are slated for both sides of Oak Street in this span of the CPP. Along Cambie Street south of West 49th Avenue to West 54th Avenue, where the 21-acre Langara Gardens redevelopment is located, there will be apartments between six and storeys. 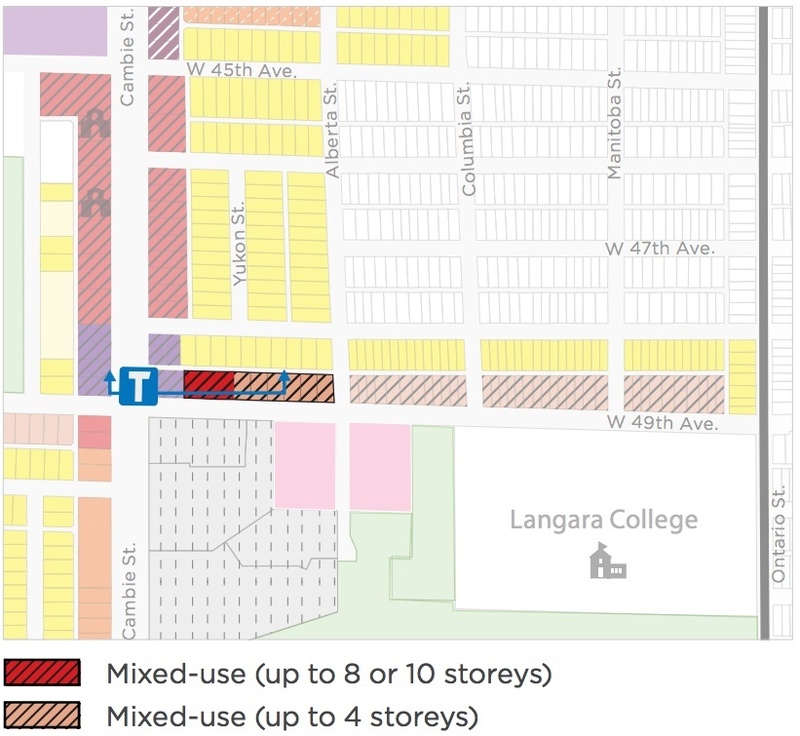 Townhouses are also in the Langara area as a transition between the taller buildings and the single-family homes. 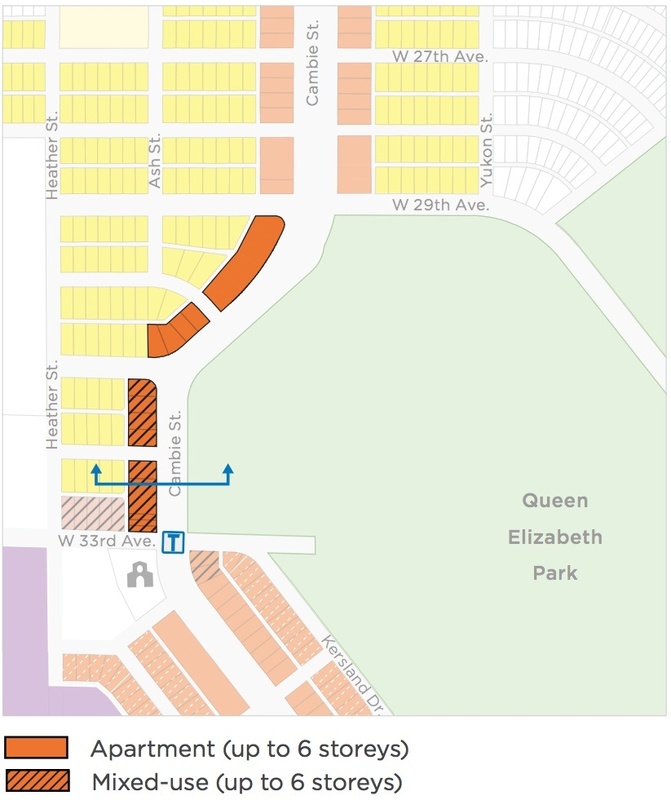 Similar densities to the Queen Elizabeth neighbourhood are planned for the Marpole neighbourhood, with buildings up to six storeys lining Cambie Street south of West 58th Avenue to West 64th Avenue. Three-storey townhouses are possible for a one-third portion of the city block from the laneway west of Cambie Street. 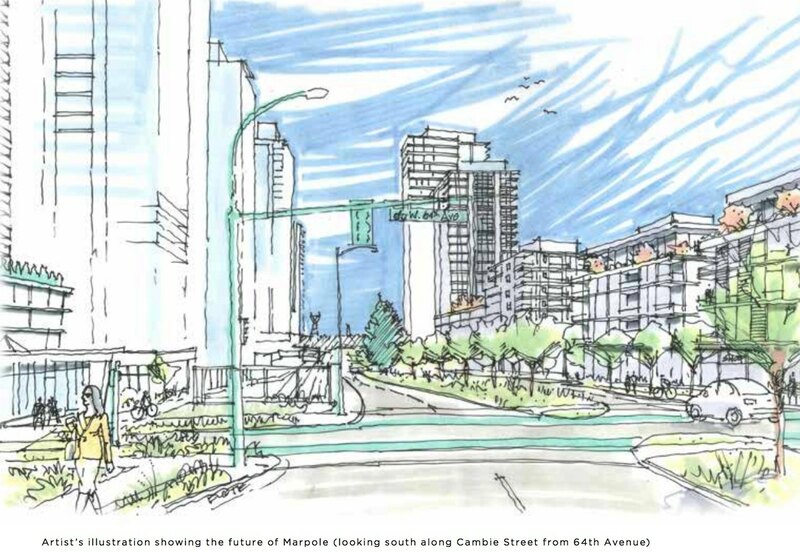 The Pearson Dogwood redevelopment is located within the Marpole neighbourhood, and a future Canada Line station could be built at the intersection of West 57th Avenue and Cambie Street. 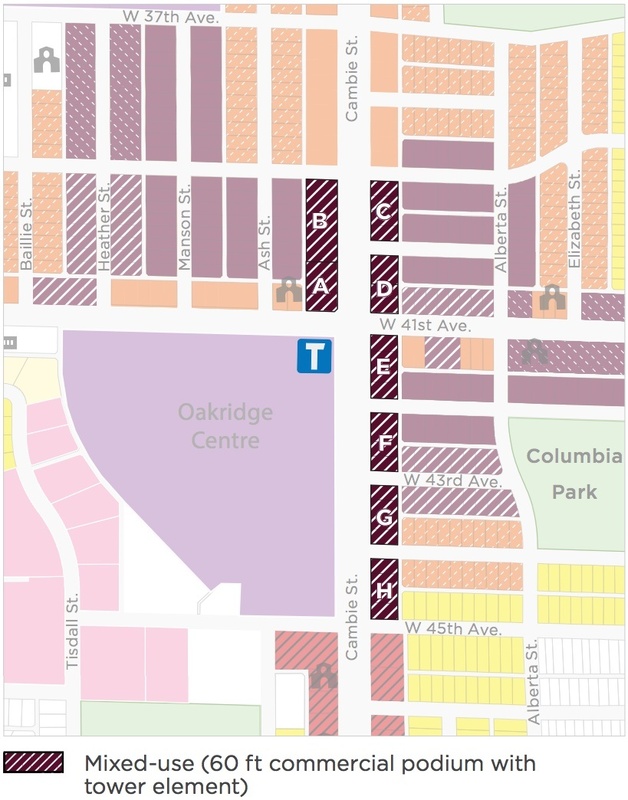 The CPP’s Marpole area is limited in size as most of the area west of Cambie Street to Oak Street is already conceptualized under the Marpole Community Plan. Marine Landing is another small district identified in the CPP, and it will become a new gateway into the city for those who enter city limits by riding the Canada Line. The area, which is only about two blocks wide on its length along Cambie Street from West 58th Avenue to the Fraser River, is largely oriented around Marine Drive Station. Much of the CPP’s envisioned densities around the station are already built due to the Marine Gateway redevelopment, which was a catalyst for residential towers in the immediate area. 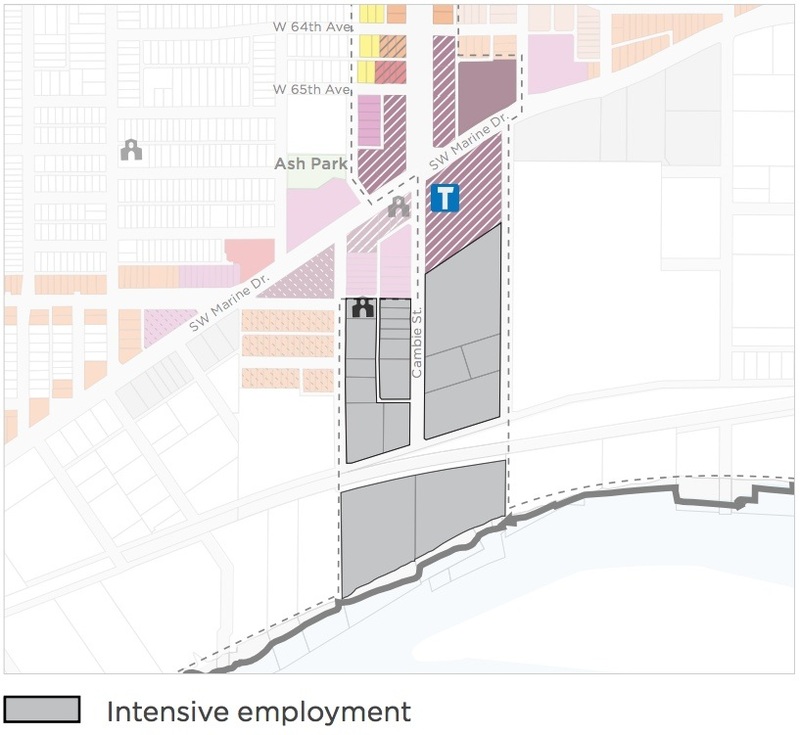 For the industrial area south of Marine Gateway to the Fraser River, between Ash Street and Yukon Street, only “high-intensity employment” buildings – such as office or institutional uses – up to 100 ft in height are permitted. Residential use is not allowed in this area.